There are few moments greater for an artist then when his work is understood. Without lengthy description, without a wordy artist statement or a Gallerina standing nearby and whispering visual cues, the person simply comprehends the artist’s work. So it was when I began communicating with John Wood, photographic historian, and lover of Japanese art, who ultimately composed the foreword to HANJO. His words put my work in a context I would be too shy to provide myself, but I admit it makes me brim with pride that my efforts were recognized and appreciated. Today when one speaks of “Japanese photography,” he or she is more likely to be thinking of the work of Masahisa Fukase, Masao Yamamoto, Daido Moriyama, Eikoh Hosoe or some other recent or contemporary artist. The idea of “Japanese photography” to others who are scholars or students of the subject might possibly think back to Japan’s leading Pictorialists, Shinzo and Roso Fukuhara, to Isao Kakefuda or Motowo Ohtaguro and/or to Modernists such as Kiyoshi Koishi, Ei-Q and others. But few are likely to think back to Kimbei Kusakabe or other late nineteenth century artists whose works are primarily characterized by being richly, hand-colored albumen prints, few, I should say, but visionaries such as Yoram Roth who has no fear of a modern vision shaped by influences from the past. Perhaps the most daring of Roth’s work is his series HANJO, a series in which he re-tells a classic Noh drama that Yukio Mishima had previously re-told. But Roth, of course, is re-telling it purely in images, images that both poignantly and peculiarly suggest their precursors, those late nineteenth century hand-colored albumen prints. One of Roth’s most striking is of a man, a kind of contemporary samurai holding a fan and wearing a Western-style jacket over his armor. Outside his open window one sees a modern factory with smoke stacks rising from it. Past and present collide here, but the jarring is beautiful. One thinks of contemporary performances, such as David Tennant’s, of Hamlet in modern dress, or François Girard’s new version of Parsifal. A modern visual aesthetic attached to a classic always allows the viewer a new perspective—and a fresh perception. 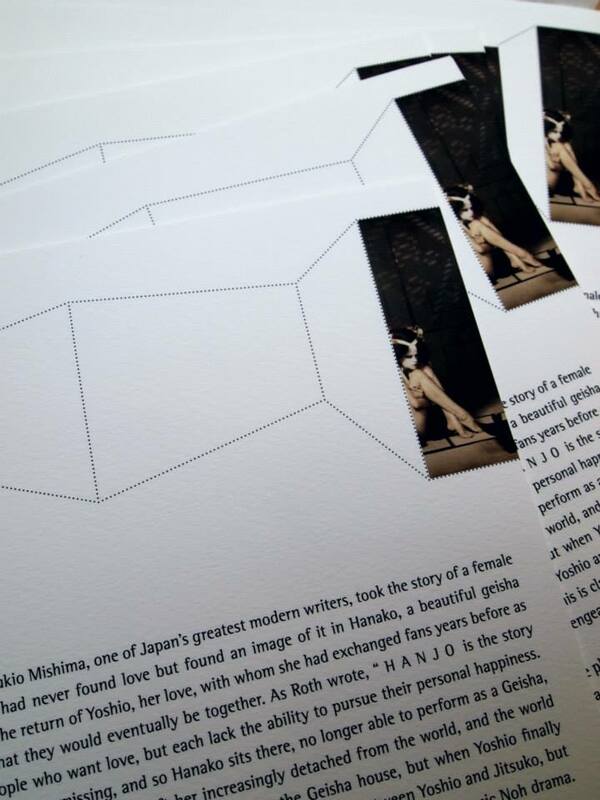 Yukio Mishima, one of Japan’s greatest modern writers, took the story of a female painter who had never found love but found an image of it in Hanako, a beautiful geisha waiting for the return of Yoshio, her love, with whom she had exchanged fans years before as a promise that they would eventually be together. 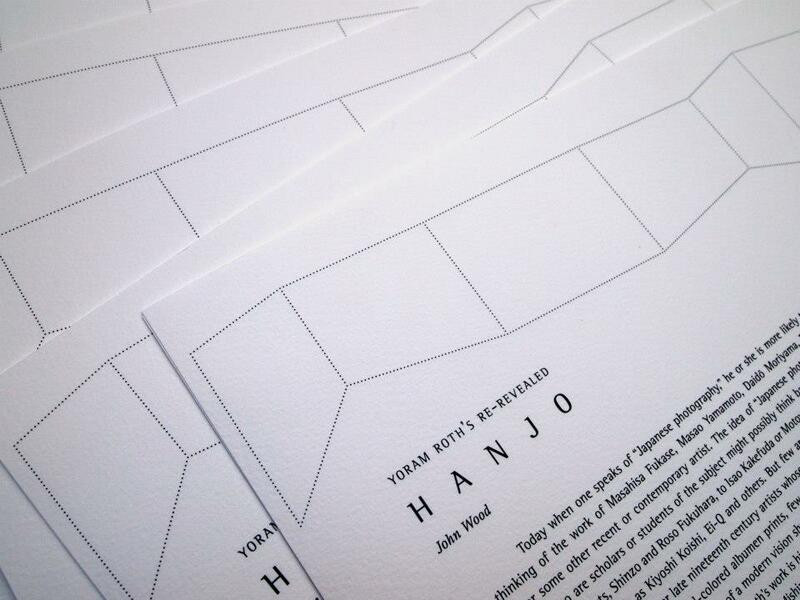 As Roth wrote, “HANJO is the story of three people who want love, but each lack the ability to pursue their personal happiness. … Yoshio has gone missing, and so Hanako sits there, no longer able to perform as a Geisha, waiting, [but] her waiting has left her increasingly detached from the world, and the world regards her as mad.” Jitsuko buys Hanako from the Geisha house, but when Yoshio finally appears, as Roth points out “a struggle develops for Hanako between Yoshio and Jitsuko, but when Hanako finally sees Yoshio … she no longer recognizes him.” This is classic Noh drama. Of the some 250 Noh plays, nearly a third of them are madness or vengeance plays. Roth’s colored images perfectly capture the action of the play. We see Hanako sitting at the train station waiting for Yoshio, Jitsuko’s jealousy and rage, Yoshio with Hanako’s fan, as well as the other events of the play rendered and caught in the suggestions of some of the earliest and most beautiful of Japanese photographs. As both a photographic historian with a major interest in Japanese photography and as a collector of Japanese paintings, I would not have thought such a series could have been created. Yoram Roth’s sensitivity to the aesthetic both of the Noh drama and of those early photographs is as creative as it is inspired.